Top floor corner unit. No one above and only one person beside you. Beautiful view of lake from family room and balcony. Full service marina offers boat rentals, paddle boats, fishing supplies, boating supplies and refreshments. Restaurant and Tiki bar on site. Leave your worries behind and come spend 2 or more nights in our newly remodeled condo. Rock lane Resort is a cozy, quiet resort with plenty to do if you do not want to drive anywhere. Lay in the sun at either of the two pools. Play any of the numerous sports. Bring you're boat and rent a slip or put it in daily at the resort boat ramp to spend the day on the lake, or boat to a restaurant on the water. Table Rock Lake is clear blue water excellent for swimming, boating and fishing. The state record Striper fish was caught in summer of 2008. We are on the lake but close to everything else. We are only two miles from Silver Dollar City, 12 miles from Branson and 15 miles from the new Convention center and Branson Landing shopping center featuring numerous shops, water show and restaurants on Lake Taneycomo. Dean and Lisa Schlueter, three children-two sons and one daughter. as well as four wonderful grand children. We love to boat on Table Rock Lake it is clear blue water. My family and I have been coming to Table Rock for 20 years. We love the lake, the atmosphere and all the wonderful people we have met here. We have raised our children on the lake and they love coming almost as much as my husband and I. We love to boat and could not ask for a cleaner more laid back lake. Jetted Tub in Master bath, Both have tubs and showers. Full service marina, Restaurant, tennis courts, basketball courts, two pools, game room, fishing dock, boat rentals. We enjoyed our stay. Place was comfortable and quiet during our spring break stay. Could use a few more utensils in the kitchen but we managed alright. Overall a good place to relax and watch gorgeous sunsets! The view off the balcony was definitely a bonus. You could see a good portion of the lake, and the entire marina. The condo was easy to access, parking was right in front. Beds and pillows were great, plenty of blankets. Living room seating was ample for 6 people, entire condo was nicely decorated. Kitchen could have used a few more utensils and some staples/spices for cooking. Appliances appeared to be new and very clean. TV and DVD were a little outdated, but had lots of channel options for the boys in our down time. Indian Point is definitely the area to stay in if you are going to Silver Dollar City. Thank you for the review. I am glad you enjoyed your stay. We thought there were plenty of utensils but will make sure to recheck and see what is missing. The television is only two years old so cannot understand how it can be updated but will check it as well. We hope to have you stay again. View is awesome. Location is very close to Branson and Silver Dollar City. Owners Great. The condo was clean and quiet. Glass tables were not child friendly, I probably should have checked that out further. Overall nice place to stay for a couple of adults. I am glad you enjoyed your stay. I am sorry about your concern over the glass table. We have never had any issue with it and they are built so strong and thick did not think it would be. It would take something very hard to break them but understand your concern. It does however show them in the pictures. We are replacing the furniture this winter so the glass tables will be gone. We would love to have you back and please check after the Winter and the glass will be gone. Individual unit was fine. Rock Lane needs to do some work on the buildings. We found the unit comfortable with all the conveniences. We did have one problem and that was not the owners fault. The internet was very slow with numerous timeouts. As past owners at this resort we experiences the same thing from time to time. Internet response seemed to slow down especially if there was a rainy period. After a few days, I decided to do a power on reset and the devices synced with the network and the internet response was now good. Given the opportunity we would certainly return to the area. We do like Table Rock Lake and what it has to offer. Our one suggestion would be to screen in the balcony. That would add value in our estimate. Thank you for the review. I am you were satisfied with the unit. We supply our own internet in our unit and it usually works fine. I wish you would have contacted me about it not working properly and I would have troubleshooted it with you or had the onsite tech guy come and fix it. The owner of the resort is in the process of updating the outside of the condos and they are looking great! 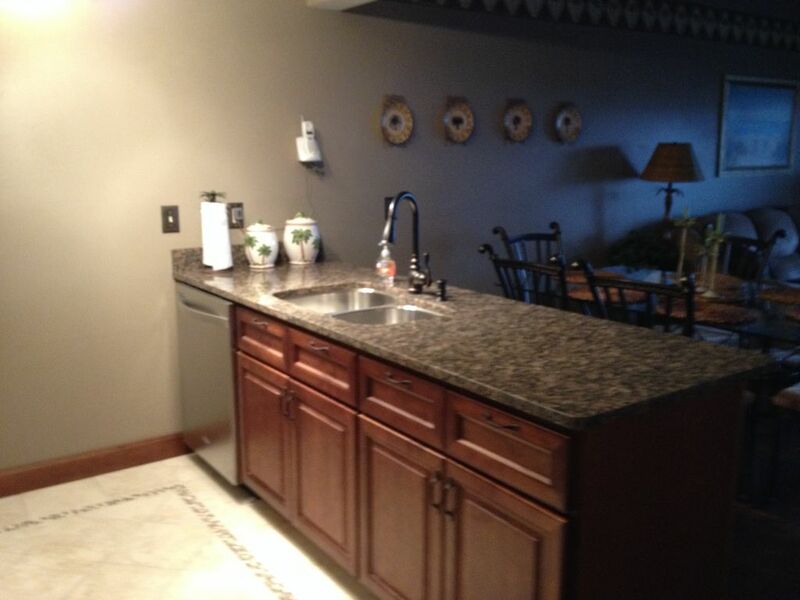 we own three condo's at Rocklane and have remodeled all of them to bring them up to date. We have thought about screening in the balcony but feel it will take away from the view and there are very few screened in balcony's in the area. I hope you do decide to come again we would love to have you. Beautiful updated condo with a spectacular view of the lake! The resort has 2 pools and a restaurant on site. We swam, ate, fished and boated right at the resort. Condo is top floor and it was quiet and peaceful. Owners were great to work with. We had a wonderful vacation and would definately return! we do not take less than seven nights over a holiday week.